So, here’s a product I’ve been hearing a lot about all over YouTube in the last few months of 2014. So, I joined the bandwagon and purchased some myself. 🙂 The package did take about a week to arrive but they did have a personalized thank you note (similar to Beautylish.com) which I always love. It just makes me feel that the company really takes time and interest in thanking their customer personally. As I was deciding on what shades to pick, I realized that I couldn’t find any videos/posts targeted towards woman of my coloring (barring TotalMakeupJunkie101 aka Eshani). Most vidoes/blog posts were by bloggers of lighter skin tone. So, that made the choices harder. But I ended up picking 4 of their matte lippie stix and 3 of their super shock eyeshadows. Each of their products retail for $5 which is exceptional for the quality. The packaging is great for the pricing. The product is packaged in a white plastic tube with a white cap and a colored bottom that matches the color of the product inside. They also have the names of the shades on the bottom of the tube. Once you open the cap, you can again see the color of the product on the tubing. The container is a twist-up (so no need to sharpen, Yay to that!). These remind me of the NARS Matte lip pencils but without the need for sharpening, with more pigment and greater lasting power! On me, these last almost all day with minimal fading even with meals in between. If you do end up eating something oily, these might come off a bit and you may need to reapply once. These are comfortable on the lips and also leave behind a stain on my lips, which I don’t mind at all. Probably the lighter shades don’t leave behind as much stain. Overall, as you can probably tell, I love these! Moving on to the shadows. The super shock shadows have a unique texture – almost a very smooth, gel-paste like consistency that glide on your eyelids. These come in a variety of finishes. I picked up 2 metallic finishes (Bae and So Quiche) and 1 pearlized finish shadow (Mooning). Frankly, I don’t see a difference in these two finishes – both have similar texture with fine glitter through them. All three are super pigmented and can create a variety of looks depending on the mode of application. Without an eye primer, these shadows do not last on my oily eyelids and tend to crease within a few hours. However, I don’t have that issue when I do use an eye primer. Using your fingers gets the max intensity with these shadows. When using a brush, it creates a softer look. I would really recommend using a synthetic brush with these shadows. 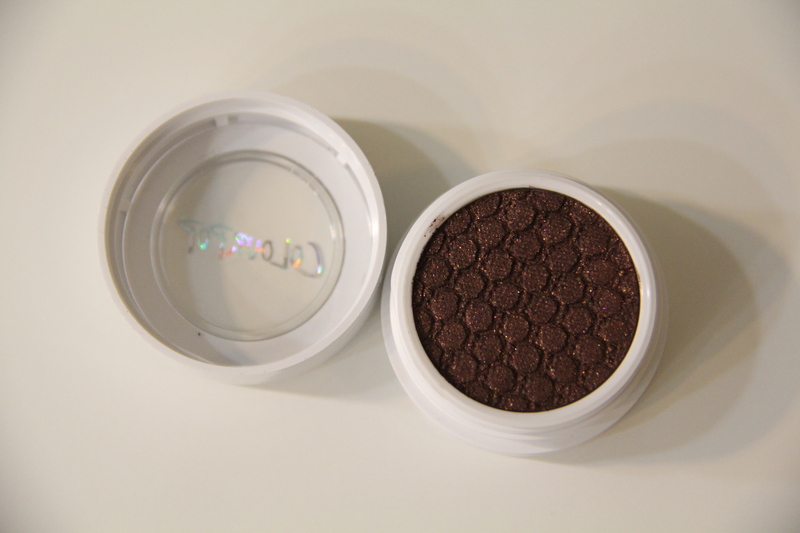 Since Dec 26th 2014, Colorpop has also expanded their super shock shadow range with Mattes! I am so tempted to get them. Arghhh… companies…. Wow! Bae looks like it could be a good dupe for Macs Blue Brown. I love colourpop! Yeah, its a cheap dupe for quite a few of these duo chrome blue-brown eyeshadows in the market. I have a few of them as well. Might do a swatch comparison.